From Butler go west on Missouri Highway 52 for 8 miles to Virginia. Turn left (south) on County Highway V and go 12 miles. 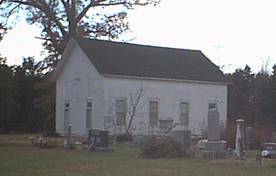 The cemetery is on the west side on the road at the intersection of V and county road # 6508. The first church to be built in Walnut township was the Independence Methodist Church in 1877.